A 2.34-million-year-old 'tool factory' has been unearthed in Kenya, the science journal Nature reports. The team behind the find say it shows that our pre-human ancestors had more sophisticated technical skills than was previously thought. The Nature report says the tools were found with bones of fish and mammals and had probably been used to cut up meat. 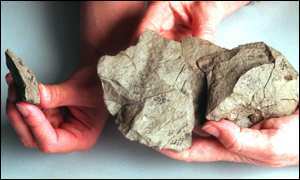 Egg shells were also found at the site, indicating that the inhabitants of the region had a varied diet. The 'tool factory' could date back to small ape-like pre-humans from before the development of the Homo evolutionary group. Helene Roche, an archaeologist at the University of Paris, said: "They were more elaborate and sophisticated than what we had seen previously or thought possible for stone tools of this age." New rocks would be tested to see if they produced the required sharp-edge flakes and would be discarded if they did not. The tool-makers knew how to chip off each flake so that it left a surface suitable for producing another flake. Craig Feibel, a geologist on the team, said: "It's not like they were just randomly whacking away and knocking off whatever happens to come off." Homo habilis, a species of pre-humans that lived about two million years ago may have been the tool makers, it is thought. Australopithecine, another early hominid, is also a candidate. Well-documented Pliocene archaeological sites are exceptional. At present they are known only in East Africa, in the Hadar and Shungura formations of Ethiopia and in the Nachukui formation of Kenya. Intensive archeological survey and a series of test excavations conducted in the Nachukui formation since 1987 have led to the discovery of more than 25 archaeological sites whose ages range from 2.34 to 0.7 million years before present (Myr), and to the extensive excavation of two 2.34-Myr sites, Lokalalei 1 in 1991 and Lokalalei 2C in 1997. Lokalalei 2C yielded nearly 3,000 archaeological finds from a context of such good preservation that it was possible to reconstitute more than 60 sets of complementary matching stone artefacts. These refits, predating the Koobi Fora refits by 500 Kyr, are the oldest ever studied. Here we describe a technological analysis of the core reduction sequences, based on these refits, which allows unprecedented accuracy in the understanding of flake production processes. We can thus demonstrate greater cognitive capacity and motor skill than previously assumed for early hominids, and highlight the diversity of Pliocene technical behaviour. Full text (external; requires subscription to Nature).